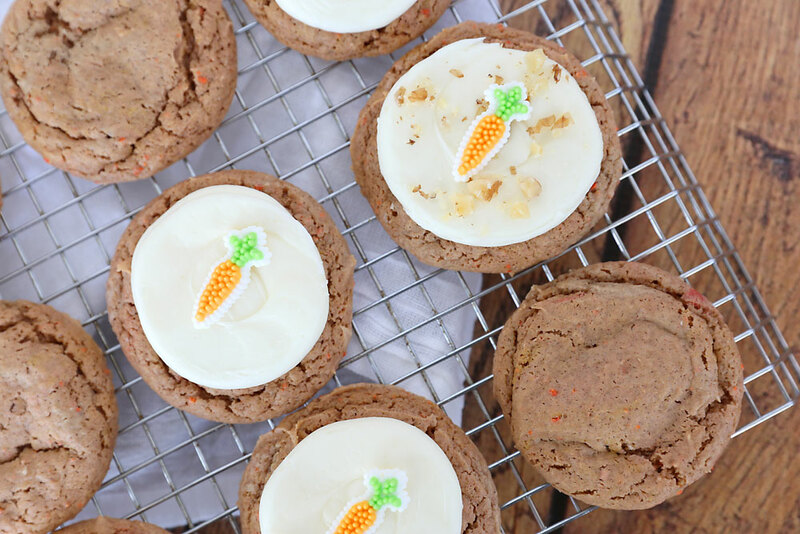 In today’s post: These carrot cake cookies aren’t just delicious, they’re also incredibly fast + easy to whip up! I’m on a mission to make cake mix cookies in every possible flavor and variety (‘cuz why not?) 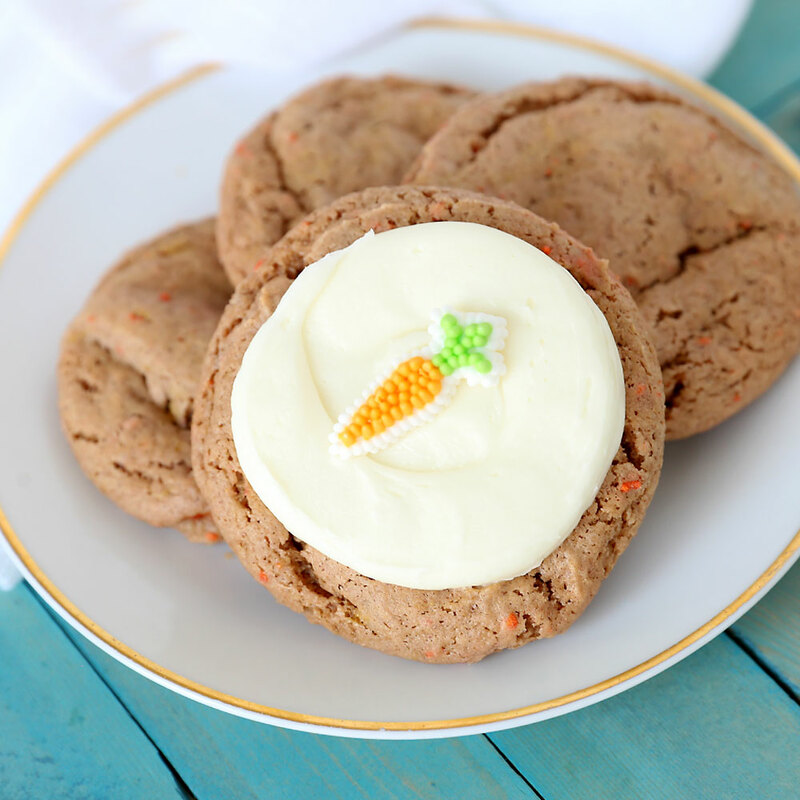 and since Easter is coming up I figured carrot cake cookies would be the perfect flavor to tackle next. 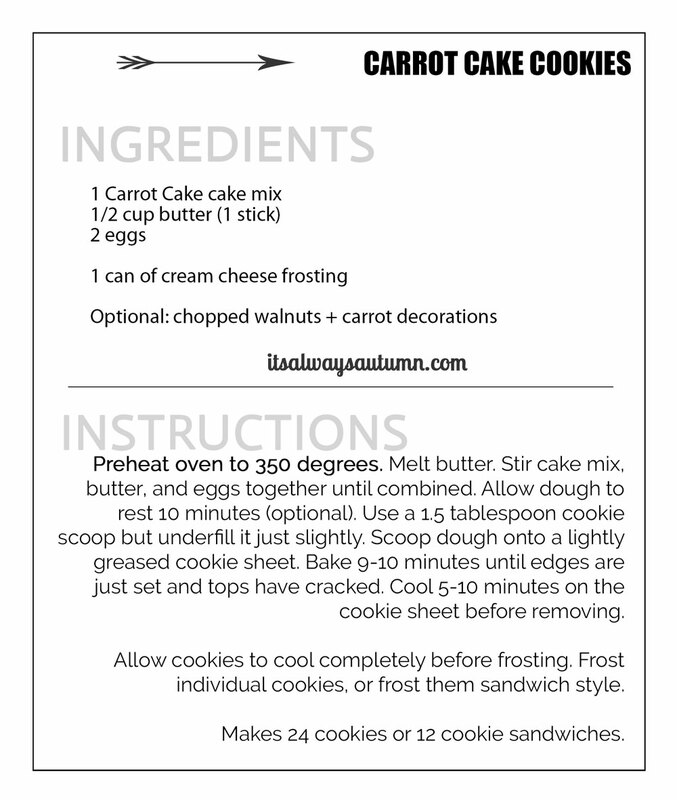 Carrot cake cake mix cookies do not disappoint! Top them with some cream cheese frosting and you are good to go. And a few chopped walnuts (or not) and a cute little sugar carrot decoration and you have super easy, super soft cookies. Cake mixes already have all the flour and sugar and baking soda and pretty much everything you need in them already, so using them to make cookies is EASY. You don’t have to measure anything. All you have to do is add butter and eggs, then stir + bake. Seriously. You can mix them up in five minutes and bake them in ten and have a tray of cookies ready in 15 minutes! Cake mixes also have witchcraft in them that makes the resulting cookies super soft. Sure, it’s probably some sort of additive I’m not supposed to eat, but you only live once, you know? And it makes the cookies SUPER SOFT! The aforementioned witchcraft also keeps the cookies soft and fresh for days. If they’re around that long. One cake mix makes a perfect sized batch of 2 dozen cookies. 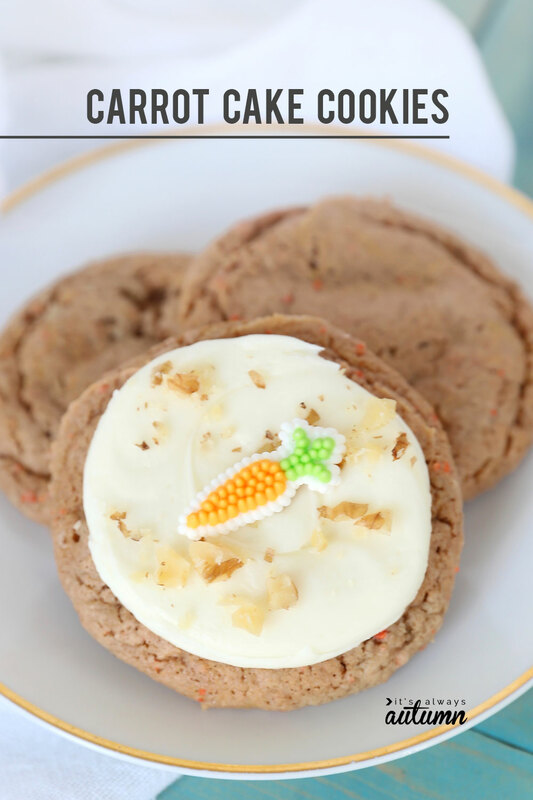 These carrot cake cookies are dead simple to make, but I have a few tips to make sure they turn out amazing. First, after you mix together the cake mix, butter and eggs, let the dough sit for about 10 minutes before scooping and baking. This is not required, but giving the dough time to rest makes the cookies turn out a little prettier (I don’t know why, but it does). Then use a 1.5 tablespoon cookie scoop that’s just a bit underfilled to scoop the dough out onto lightly greased cookie sheet. NOTE: I used a Betty Crocker carrot cake mix for these cookies. 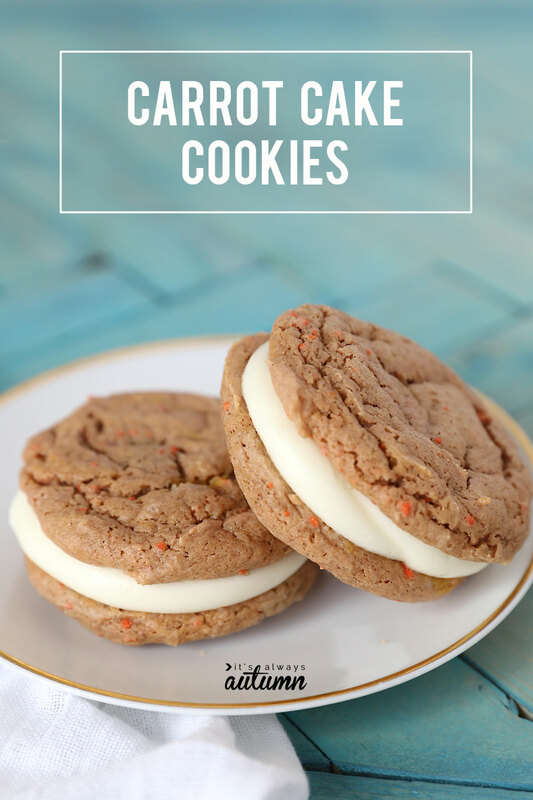 The first time I made them I thought they needed a bit more color, so for the cookies seen in this post I added some orange food coloring as I was mixing up the dough. I think it makes the cookies a bit prettier, but it’s absolutely not necessary. You want to be sure not to overbake these! Bake them until they are puffed and cracked on top. The edges will feel just set, but the middle will still be soft. That takes 9-10 minutes in my oven, but yours may be a minute longer or shorter. Then let them cool on the cookie sheet for 10 minutes or so before removing to finish cooling on a wire rack or on a paper towel on the countertop. They will flatten just slightly as they cool. The top photo below shows them right out of the oven, and the lower photo shows how they flatten a bit as they cool. 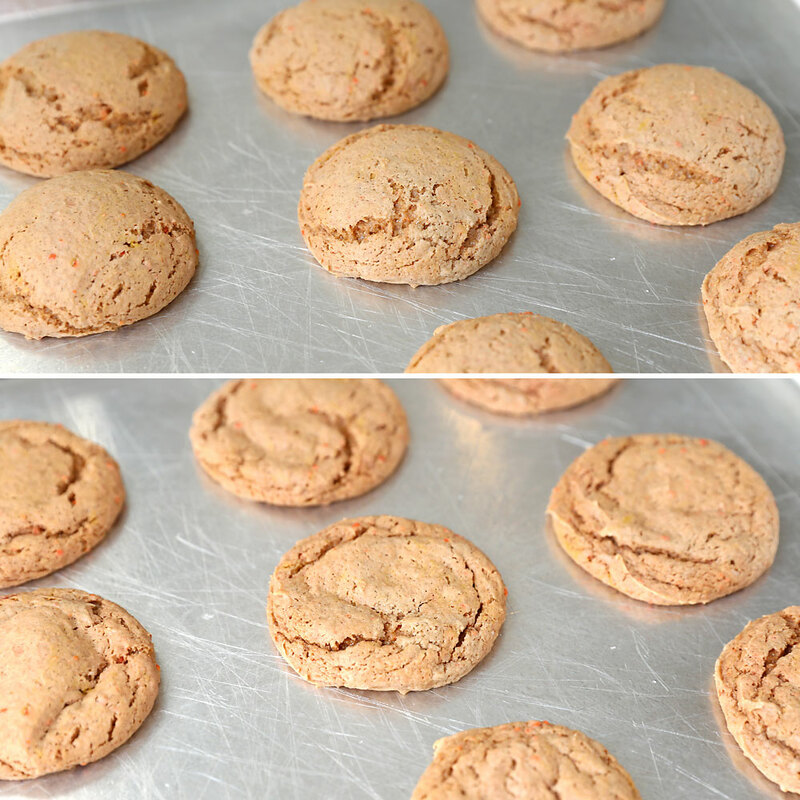 If your cookies flatten so they are super thin, you need to cook them just a bit longer. If your cookies don’t flatten at all, you’ve overcooked them and they won’t be as soft as they should be. Be sure to wait until they are completely cool before frosting. The recipe makes 2 dozen individual cookies, or 1 dozen sandwich cookies. What brand of cake mix do you use? I like to use either a Betty Crocker cake mix or a Duncan Hines cake mix. Why are my cookies flat? I live at high altitude, which means cookies tend to go flat, so I almost always increase by oven temp by 10-15 degrees when baking cookies. 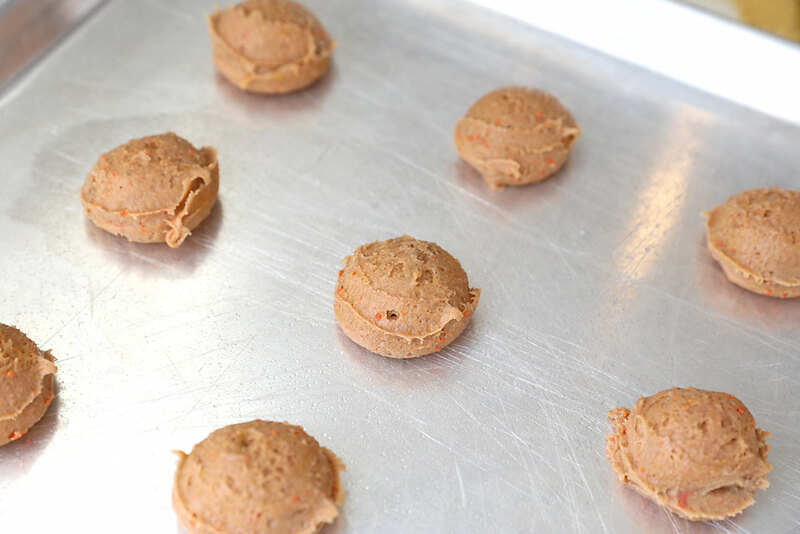 This helps prevent them from flattening – just check on them a minute early to ensure you don’t overcook them. If your cookies are flat, you can also try baking them a minute or two longer, or adding 2 tablespoons of flour with the cake mix. Where can I find the carrot decorations? I used these Wilton carrot icing decorations (affiliate link) and I found them at Walmart in the Easter section for $2. thanks for the great information. it has help me.